If QR does not have availability for JNB-DFvia DOH , then the agent cannot book it. 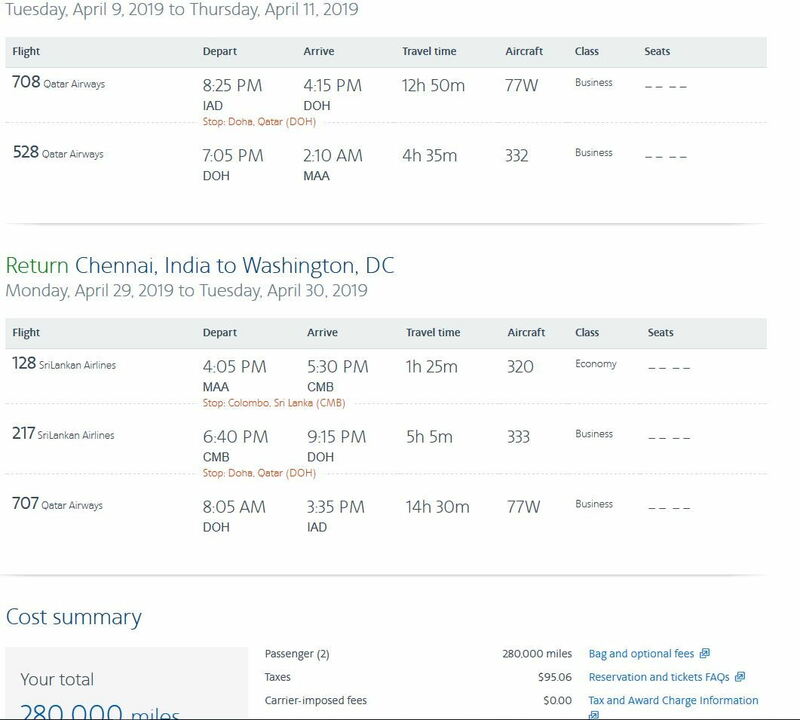 To paraphrase AA's change policy, an even exchange to a different date can be done without repricing so long as the cabin classes remain the same and the departing/arrival cities remain the same. Here, IAD-MLE are the departing/arrival cities which remain the same. The change only required switching from QR 674 (later flight in J) to QR 672 (earlier flight in J). Both travelers and service providers are known to act irrationally, and travelers perhaps especially so. If something is currently scarce, we have an unconcious bias to assume that it must be more desirable. And the airlines instinctively assume that whatever travelers currently want must be automatically bad for their bottom line. Now imagine if the herd of travel bloggers all come out next month with trip reviews like this: I went on insane zigzag award trip, hit 5 Admiral Clubs, stuffed myself silly with free booze and trail mix in each of them -- and it was phenomenal. Thank you AA for stupidly making such convoluted itin's possible. I bet all award segments will become unmarried overnight. Happy and in4tar like this. So I may have spoken too soon? Checked tonight and those 2 legs are missing - AGAIN. I called customer service and they state they show cancelled by Qatar due to "invalid tickets". The rep and the help desk worked on this for over 30 minutes and realized that QR is showing our original ticket #'s on their end - before a schedule change had me re-ticketed - and not the most recent ticket numbers. He said their liaison would send a message to QR asking them to not cancel these again but he honestly didn't sound hopeful and said he'd never sen this happen before. It's been recommended I reach out the QR with the new ticket #'s and ask them to stop canceling these because they're valid. I haven't had the best luck previously calling QR, so any recommendations on the best way to do this? Phone vs email vs...? Thanks. I did just check QR's website via Manage My Booking and the AA rep is correct - the wrong, original ticket numbers are still attached to this PNR. Edit: I did find a few routings with business availability in late August-early November and also the spring so it doesn’t seem like everything is gone. Yesterday there was almost daily availability for Nov/Dec 2019 on BA, QF and AA for most US gateways-Doha which has now vanished. Phone reps are not able to see it either. Non US segments as well as economy segments can still be booked but either there is a glitch hiding availability or QR just pulled all premium availability to and from the US for Nov/Dec. I was going to book MLE-DOH-LAX today. Have been scouting availability for the past couple months using QF, BA and AA sites. Yesterday there was quite a bit of availability in business through several US gateways that I had searched (LAX, ORD, DFW, JFK etc) for late Nov early Dec. This morning I went to book the flight and there is nothing. I’ve searched a ton of days with the above airports for next fall/winter and can’t find a single premium Qatar ticket between Doha and the US in either direction. Not sure what is going on but all Qatar premium availability to and from the US seems to be gone. Maybe it’s just a glitch and it will be back later? AA site does show some Qatar premium routes but they all fail when you click through to book. I just searched and found this myself, as well. Do you know if this sudden disappearance of QR premium inventory has happened before, and if so, was it then restored afterwards? I did a random search for USA-DOH-IND, and this is what I came up with it...couldn't go to the last screen as I don't have the miles needed, but it appears there is QR premium inventory available and bookable even? Are the issues being reported happening due to the married segment availability restriction imposed by AA recently? Yes, this has happened before. Obviously it was restored afterwards, because there was abundant availability at the 330-day mark even a couple of days ago. All of that has now disappeared again. There is no way to know how long this will last. Yes and yes but not on a known schedule or timeline. I've seen it change back in a day and also a couple of months on some routes. Yeah I sifted through all 41 pages of this thread and it looks like it has happened previously. US-Doha premium class availability still exists in the spring and early fall of 2019. There was substantial availability all throughout November until the 331 day mark the first week of December on AA's site up until two nights ago. There was premium availability beyond that on the the BA site. It looks like QR removed all premium class inventory after November 3 2019 on all US-Doha routes in both directions. I called AA, both US and Singapore (Etihad method) call centers and neither could find any availability. I'm trying to book 12/5 MLE-DOH-DFW-ABQ with Qsuites but will just book Etihad J instead to make sure I have a ticket back and will change the routing if Qsuite availability returns. I noticed that when searching on QF, the "from" box doesn't recognize Doha, but recognizes it in the "to" field. The way around that I found is to search multi-city and enter Doha as origin on the second leg. Is everyone doing this when searching for Doha outbound flights? I had no problem booking one way ORD-DOH-SIN in J for Dec. 1 using AA reward for 2 tickets. It showed up on the AA site on Saturday morning at the 331 day mark as the DOH-SIN segment is on Dec. 2. I was able to hold the itinerary on the web. I called AA and had them book the tickets rather than doing it on the web as I was using miles from two accounts and needed them to link the record locators. No problem. Got my QR record locators and called QR to get my seats EF on Qsuites . I had no problem booking one way ORD-DOH-SIN in J for Dec. 1 using AA reward for 2 tickets.